Bluegrass Sports Nation game of the week: Week five of KHSAA Football. Leslie County Eagles vs. Breathitt County Bobcats. 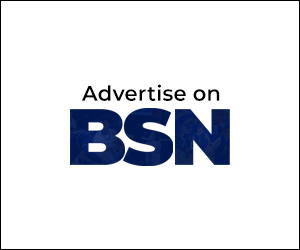 This week’s Bluegrass Sports Nation game of the week featured two teams that once dominated the gridiron, but have struggled recently. Leslie County entered tonight’s matchup with a one win and three loss campaign. Leslie County opened the season with an impressive victory over Pineville with 47-22 victory. Leslie has since gone on to lose the next three games of the season, losing to Whitley County 41-13, Willamsburg 46- 41, and last week suffered a 34- 12 loss to South Laurel. Breathitt County who once a powerhouse in football from the mid 1990’s through the first decade of this century, has struggled in recent years and has gone winless in four games this season. Breathitt County has been defeated significantly by Montgomery County 47- 12 in week one, Perry County Central 51-6 in week two, Floyd Central 28-6 in week three and Prestonsburg last week 60-26. In the same era when Breathitt County become a Football powerhouse winning three class 2A state championships over a period of seven years, Leslie County was also a competitive program and produced one of the best athletes to ever come from the state. Tim Couch was a phenomenal athlete in Football and Basketball. 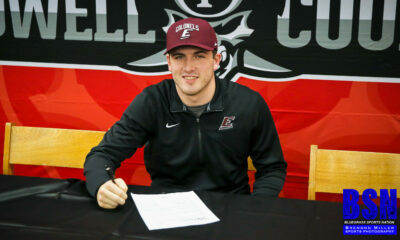 Couch was a highly heralded Quarterback and drew interest from several division one schools such as Tennessee, Alabama, and Kentucky. 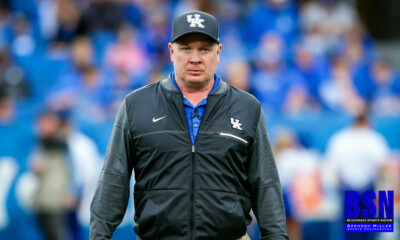 Couch would later go on to play for the University of Kentucky, be a finalist for the Heisman Trophy award, and go onto to be the number one overall draft pick of the NFL Draft in 1999. As a former native of Breathitt County and alumni of Breathitt County High School, I remember the battles between Breathitt County and Leslie County during the Couch era being epic, drawing spectators, fans, and news coverage from across the Commonwealth. When the Eagles and Bobcats would play they were in the same class of Class 2A, both ranked in the WYMT TV top ten coverage area. The games usually come with huge stakes on the line, potentially home field advantage on the or playing for the right to advance in the KHSAA playoffs. 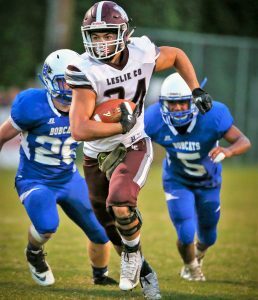 While Couch was the attraction everyone wanted to see and gathered most of the attention around Leslie County Football, Breathitt was a more balanced team and often got the best of Tim Couch and the Eagles. The battles between the two teams are talked about as some of the greatest moments in East Kentucky Football history. Leslie County received the ball to start the game, finding the end zone on several scoring possessions in the opening quarter. From the opening kickoff Leslie County seemed like the more focused and better prepared team. Leslie County would score two touchdowns in the first ten minutes of the opening quarter. The first score occurred with 5:54 remaining in the quarter with a fifteen- yard touchdown run by #24 Taten Smith. On the next series, Leslie County would intercept the ball in Breathitt County territory and later find the end zone on a five-yard touchdown run by #1 Luke Lewis. Leslie would attempt and convert on the two- point conversion giving the Eagles an early lead of Leslie County 14- Breathitt County 0 with 4:48 remaining in the opening quarter. Breathitt County had some positive moments in the opening quarter, but were unable to score. Trey Noble # 11 would get the ball on the kickoff and break a thirty- yard return into Leslie County Territory, nearly taking it for a touchdown before being brought down by a multitude of players from Leslie County. Cameron Stacy #10 would use his big strong body and rush the ball with a quarterback sneak, picking up several first downs. Before the second quarter started Breathitt would march the ball down the field inside the red zone to the five -yard line. Breathitt turned the ball over to Leslie County just before crossing the goal line at the three- yard line. The first quarter ended with the score Leslie County 14- Breathitt County 0. To start the second quarter, Breathitt County was a team gasping for air and began to play risky football. On one series early in the second quarter Quarterback #10 Cameron Stacy lined behind the center in the shotgun formation and threw an intercepted ball deep in Breathitt territory, giving the Eagles excellent field position at the Breathitt eleven-yard line. The Eagles scored on the next series as QB #9 Darron Whitaker passed to #22 Alex Farler for a seven- yard touchdown. The Eagles were now up three touchdowns, Leslie County 20 Breathitt County 0. Breathitt County would get on the scoreboard late in the half, with their best offensive series of the half. #10 Cameron Stacy would find #6 Brandyn Slaughter in the end zone for a twenty- yard touchdown. Breathitt County would miss the PAT and now trailed Leslie County 20- 6. For the first time in the game the Breathitt County faithful had got excited, although trailing by two touchdowns, this was the best series Breathitt County had in a couple of weeks. The Cannon Fired, which is a tradition after scoring touchdowns at Mike Holcolmb Athletic Complex and the young Bobcats suddenly felt excited about the team. The fans who were quiet during most of the game was getting excited, reminding me of Breathitt County Football of years back. The momentum wouldn’t last for long as Leslie County ended the half with another scoring possession. QB Darron Whitaker found #33 Tyler Dixon in the end zone for an eleven- yard touchdown. Leslie County now led the Bobcats again by three touchdowns. Leslie County 28- Breathitt County 6. Leslie County would get the ball to start the second half and continued to dominate the game with their rushing game. Leslie County would score two unanswered touchdowns in the quarter, essentially putting the game out of reach. Leslie County rushing attack would often rush for more than ten yards on each rushing attempt. On the scoring plays Leslie County would show some of their versatility with two passing touchdowns, not rushing touchdowns. The Eagles scored with 9:54 and 5:26 remaining in the third quarter. The first touchdown was a pass from Whitaker to #4 Dylan Adams. The next scoring possession was another passing touchdown from Whitaker #3 Nick Hoskins. At the end of the third quarter the score was Leslie County 44- Breathitt County 6. Leslie County scored one more time in the game with a one -yard touchdown run by #44 Connor Hollin. The scoring play was a 3:27 drive, giving Leslie County the largest lead of the game. Leslie County 50- Breathitt County 6. With the game in hand, Leslie had put in their reserves to finish out the game. Breathitt County found the end zone as time was expiring in the game. Breathitt County ‘s #26 Dalton Manns rushed for a four- yard touchdown with only 16.4 seconds remaining in the game. Breathitt County converted on the two- point conversion with another #26 Manns five-yard run. Leslie County would go on to defeat the Breathitt County Bobcats 50- 14. Leslie County improves on the season with a record of two wins and three losses. Leslie County will now travel to Pike County facing the East Ridge Warriors. Breathitt County remains winless with a 0 and 5 record. Breathitt County will also travel on the road to face the Knott County Central Patriots. Good luck to both teams the rest of the season, as it has been a pleasure covering your teams. Stats have been provided by WJSN radio host Steven Neace. Penalties 6 for 48 yards. Rushing leaders ( top 4) Taten Smith 16 attempts for 89 yards, Luke Lewis 5 attempts for 50 yards, Deon McCulley 4 attempts for 31 rushing yards, and Tyler Smith 2 attempts for 25 yards. Darron Whitaker nine completions on eleven attempts, one interception, passing for 173 passing yards. Receiving – Tyler Dixon two catches for forty- eight yards, Nick Hoskins two catches for forty- four yards, Taten Smith one catch for twenty- one yards, Alex Farler one catch for eighteen yards, and Luke Lewis one catch for six yards. Interceptions- Jarred Fields one interception with a net gain of twenty yards. Dalton Morgan one interception with zero net yards. Rushing yards 17 attempts for 57 net yards. Rushing leaders (top three) Cameron Stacy six attempts with a net gain of thirty- three yards. Dalton Manns seven attempts with a net gain of nineteen yards. Tyson Gross one attempt with a net gain of seven yards. Passing – Cameron Stacy eight completions on twenty- three attempts, two interceptions, passing for 188 yards. Receiving- Brandon Slaughter three catches for ninety- five net yards, Trey Noble four catches with a net gain of ninety- three net yards. Interceptions- Charlie Hudson one interception with a net gain of seven yards.